Ranging from small to large these balls stacked bonsai trees, has a single, double, or triple stacked. 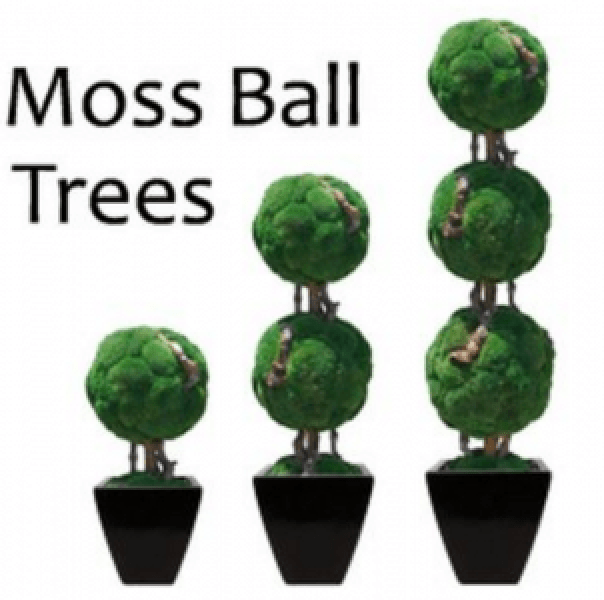 However, no matter the size of the tree each moss ball has gone through the preservation process in which a glycerin solution as been applied after the plant has been placed in a hot and low humid environment at which time the plant naturally soaks up the glycerin solution once it is dehydrated. Additional to this process and FDA approved food dye may be used on occasion to enhance and/or give the tree a specific color in an effort to make it look even more real. As with any of the other plants discussed in this article when it comes to maintaining the plant the only requirement involved include dust in the plant from time to time using a feather duster or a can of air that is sprayed at least 2 inches away from the plant. Furthermore, it is highly recommended that this plant not be exposed to any direct sunlight, not be placed outdoors, nor be given any water as doing all these things will drastically reduce the 7+ year lifespan of the plant. Because this plant is more along the lines of traditional to modern, in terms of its to core style, this plant will look good in nearly any type of modern to traditional decor style and will look great with any peace within each of these styles. As far as the uses for this plant goes place in the plant in a high-traffic area where it can easily be seen as one way to expand upon the overall look of any room. Additionally, this plant could be placed as a standalone piece along any wall or directly next to any other furnishings or stylistic pieces that this plant can easily be incorporated with.